I’ll never forget one of my favorite Thanksgivings spent with my husband’s family. We were living in Colorado at the time and decided to host that year. Family from California and Washington made the trip to be there and given the fact we all don’t see each other very often, it was a Thanksgiving to go down in the record books. We had my husband, his two brothers and sister – plus their families – all under one roof, and it was so much fun. As a thank you gift for hosting, one of his brothers gave us two really nice knives. He was responsible for the turkey and took on quite a bit of meal prep in my kitchen. So he learned first hand just how bad my knives were. I didn’t realize how bad they were until I used the new ones. That’s when I realized how having the right tools in the kitchen makes all the difference in the world. Since my two sons have become vegetarians, I have chopped more vegetables in the last two months than I think I have in the last year. I’ve realized a couple of things since being on this adventure of preparing and eating vegetarian meals: one, good knives make all the difference in meal preparation and two, vegetables are incredibly filling! 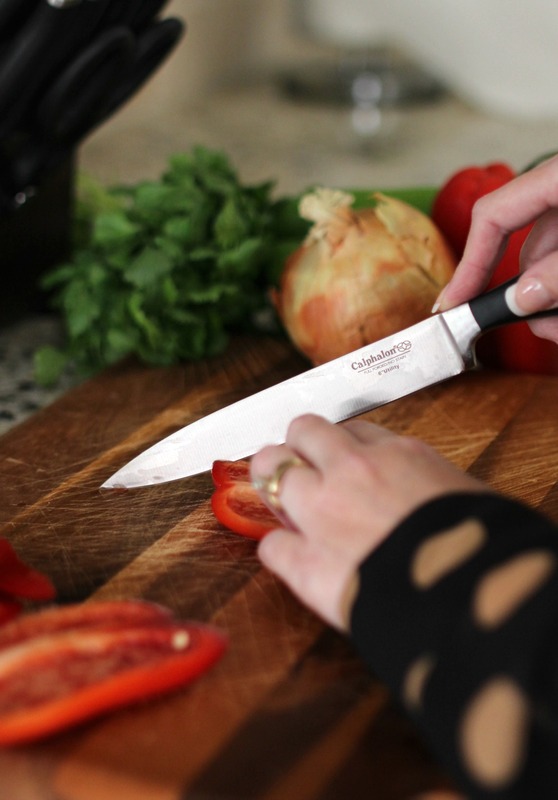 I was recently sent the Calphalon Self-Sharpening Cutlery set and have felt like an absolute whiz in the kitchen. 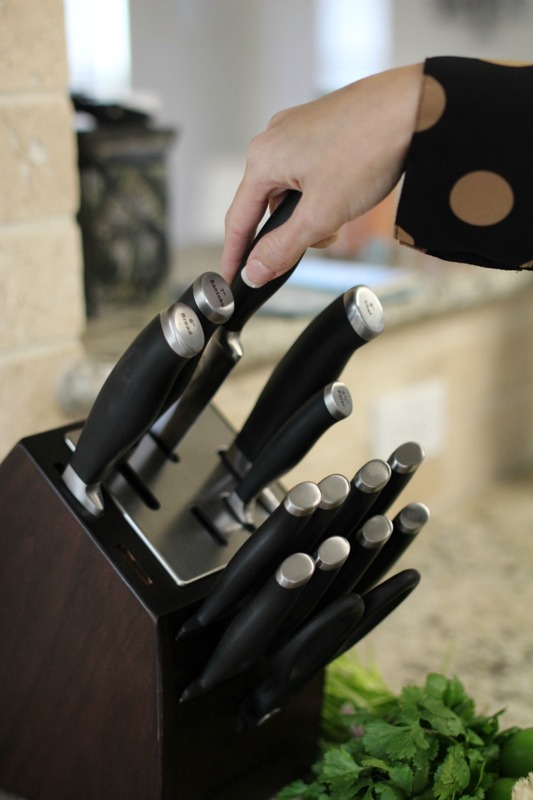 Because of the ceramic sharpeners built into the storage block, they are sharpened automatically with every use, which means the knives are ready for me and at their peak performance every time. Dull knives in my kitchen are a thing of the past. Now that I have high quality, high performing knives, I need to sharpen up (pun intended) on my knife handling skills. 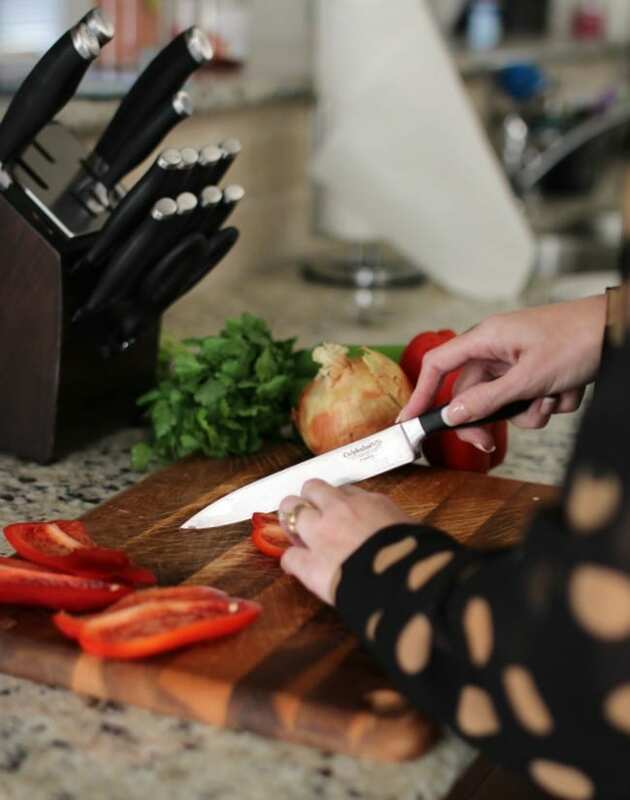 Calphalon has an excellent set of videos to help us better get a handle on (sorry, couldn’t resist) our chopping, slicing and dicing skills. We eat a ton of bell peppers and this video shows the best way (and which knife is best to use) for slicing and chopping red peppers. I wanted to test out my knives on a recipe that required quite a bit of chopping. So, I decided on a Veggie Faijta Salad. It’s healthy. It’s filling. It’s fantastic tasting. It’s fast. It’s beautiful. We’ve been eating quite a few smoothie bowls with fruits, so why not a bowl of different veggies for dinner? Slice the onion and peppers. 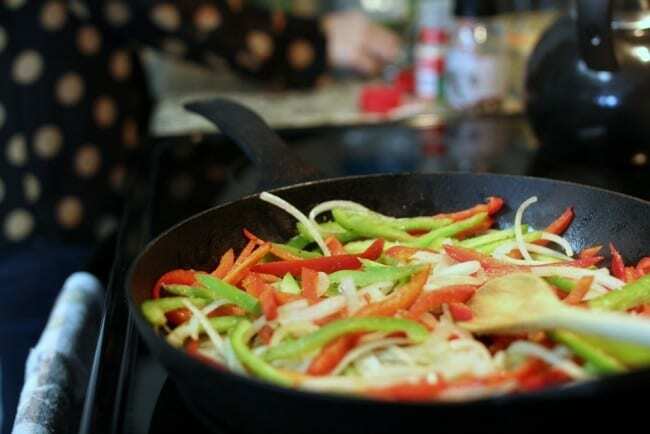 Cook them in a cast iron skillet with some vegetable oil, to get that nice black char restaurant fajitas have. Add the spices and a squeeze of lemon juice (or lime), mix then let them sit for a few minutes to blacken and caramelize the onions a bit. Stir and cook a few more minutes until they’re done to your liking. While the peppers are cooking, warm up some refried beans. I did 1/2 a can for four of us. 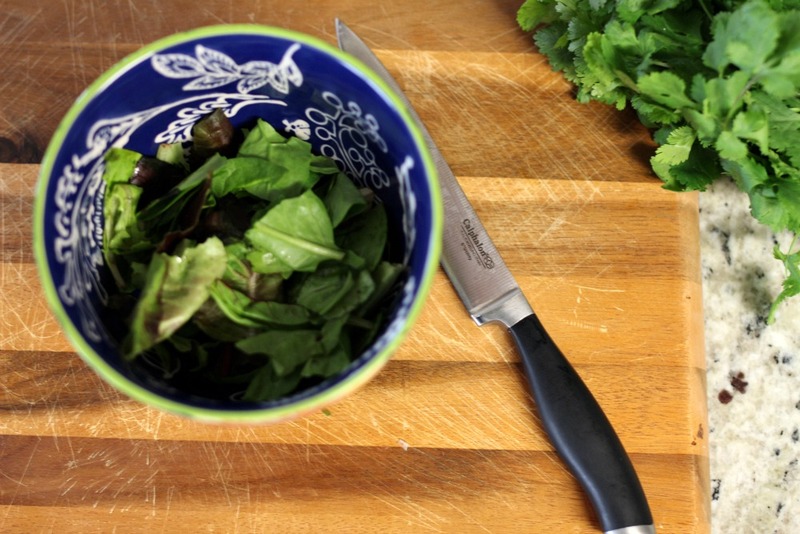 Place a handful of salad into each bowl. Chop the cilantro. After the peppers are finished cooking, divide them up among the four bowls. Spoon in a dollop of refried beans, sour cream and picante sauce. (Also guacamole if you like.) Add some tortilla chips (we used blue corn) and sprinkle with the chopped cilantro. Dig in and enjoy! Here’s the printable recipe for this super easy meal idea. Enjoy! 1. 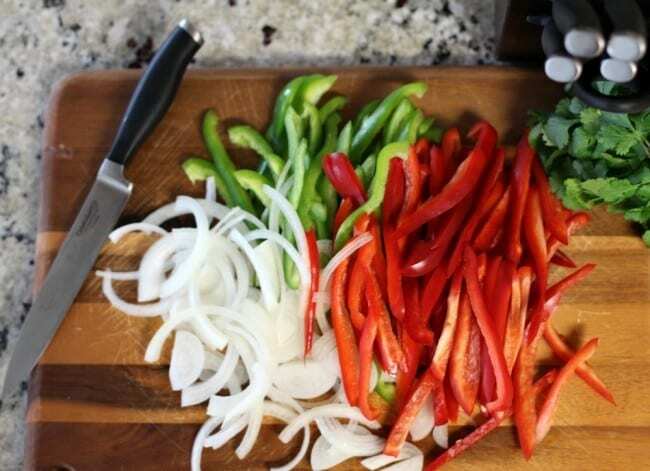 Slice peppers and onions. Heat the vegetable oil in a cast iron skillet (non-stick skillet will work too). Once oil is heated, add peppers and onions. Stir around to coat them with oil. Add garlic powder, cumin, salt, pepper and freshly squeezed juice of 1/2 lemon. Stir and let sit. You want the vegetables to get a little black char. After they're done to your liking, set aside. 2. While the peppers are cooking, prepare your other ingredients. Chop the cilantro. 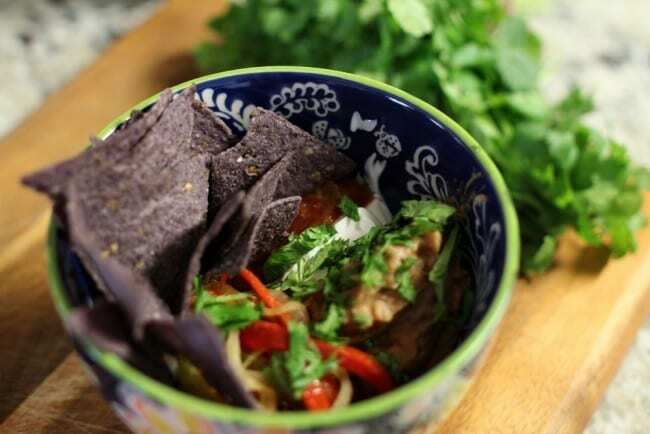 Warm up the re-fried beans, get out the salsa, sour cream, salad and tortilla chips. 3. Divide the salad among 4 bowls. Scoop the peppers on one side of your salad bowl. 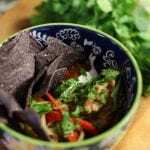 Put a dollop of sour cream, a spoonful of salsa, a spoonful of warmed re-fried beans, a handful or tortilla chips and finish off by sprinkling with cilantro. Love making tacos and a really colorful salad. This looks fantastic, and for non-vegetarians, adding some shredded chicken to the mix would make it equally divine! One of my favorite foods to make this time of year is a sort of vegetable stew. My family isn’t huge on veggies (I wish they were) but a pot of this stuff doesn’t last long in my house. Basically it’s all the Autumn harvest vegs… the last of the zucchini and yellow squash, acorn squash, sweet potato, carrots (we do red, yellow, and white in addition to the orange in our garden), yukon gold potato, tomatoes, vidalia onion, and sometimes peppers (but I’m not really a fan). Then I add in some fresh baby spinach, sugar snap peas or green beans, and my special mix of seasoning that makes it all taste like heaven. Soup it up with some chicken or vegetable stock and you’re good to go! beef bourguignon with pop overs! Anything Mexican! If I have to choose one Mexican dish it would be carnita tacos. That recipe sounds yummy!!! And couldn’t agree more about good knives – I am long overdue!! I really like to try new recipes…my most recent fave was a ckn dish with a creamy cheesy white wine sauce and veggies and pasta and bacon. NOM NOM!!! Love making stuffed peppers and sharp knives would make dicing the veggies for the pico topping so much easier. Not sure I’ve ever had really good knives so I am excited at the chance!! Love your recipes, going to try them out. Yum! I’m definitely going to need to try this. Looks delicious! I’m partial to stir-fry, because you can throw in just about anything and it’ll be yummy. My newest favorite meal to prepare is noodles in a homemade peanut sauce served on iceberg lettuce with carrots, red, and green bell peppers, YUM! I love to make my famous Steak and Oyster salad. I love to make tacos! There’s so many options that everyone in the family is happy with the choices they get on taco night! 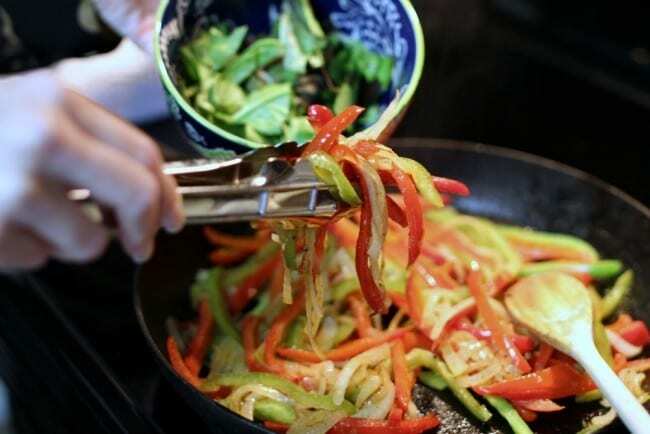 Love site fry, chopping up the fresh veggies and cutting up the beef or chicken. I love making Mexican meals – fajitas spanish rice and refried beans! Honestly my favorite meal to prepare is Thanksgiving dinner with all the fixins. I cook for the whole family for the Holiday , its alot of work but so worth it making the family happy with a great meal. My favorite meal to make is fresh chili. I like making all kinds of stir-fry dishes. I usually make them with chicken and whatever vegetables I have on hand. I love making eggplant parmesan using the japanese eggplant I grow in my garden. I like machining veal parmesan and gnocchi. I love to make my own ravioli! Time consuming, but so much fun! I like to make a crawfish corn chowder served over rice. I love making lasagna-any kind of lasagna! 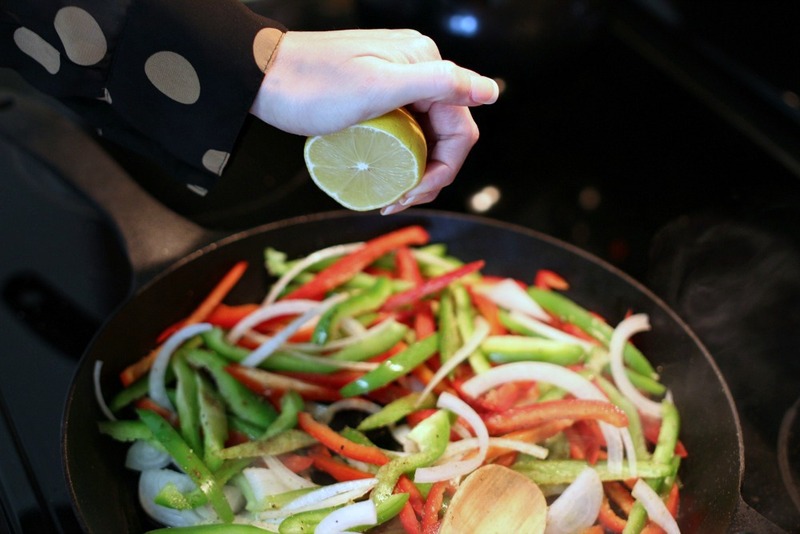 My favorite meal to cook and share is our oven baked chicken fajitas! Our favorite! I love making tempeh stir fry. it is so delicious! I’d love to make some beef stew with these knives! I love to make lasagna and garlic bread. I like to prep stuffing and carrot souffle. My favorite meal to prepare is homemade soups. I like the aroma as it simmers on the stove. I love making summer salads! I love making my homemade potato salad, because when I make it, I get to eat it. I love making homemade pizza loaded with peppers, onions, and whatever other veggies are in my fridge. We make a fabulous root vegetable soup. My fav to make is a baked or grilled Salmon topped with Lemon Pepper,minced garlic,Fresh Lemon slices and butter along with fresh asparagus and hollandaise sauce and baked potato! I like prepare veggie stir fry dishes. I love to prepare Crab Louie Salad. My favorite meal to prepare is lasagna. I like to make my baked spaghetti. My favorite meal to prepare is prime rib roast with mashed potatoes. One meal that our family enjoys is a big pot of beef stew with lots of veggies. Any kind of Mexican food, especially chicken tacos or pork carnitas. My favorite meal to prepare is my Jambalaya Just chopping up all the vegetables and adding all the spices makes me smile as it reminds me of watching my grandmother do the same thing when I was a little girl. I like to make green chili stew and cornbread. I like to make veggie lasagna. I have so many favorites that I love to prepare – and eat! Stir fry’s and pasta salads are very high on the list. Our current obsession is a buffalo chicken pasta salad. I love making mac and cheese. It’s so tasty and a great comfort food during the fall and winter months. I like to make cashew chicken stir fry. Lots of chopping so these knives would come in handy! I’d love to try that fajita salad! I love to make tacos, it would be a lot more enjoyable with a good set of knives. I love to cook shrimp and chicken stir fry! I love to make Green Bean Casserole (which isn’t what you think – it’s more like Shepard’s Pie!). It’s my husband’s favorite, too! I love making a good stir fry with a ton of vegetables. I love to prepare shrimp scampi! I like to prepare chicken and dumplings. I love making pot roast. I love to make Chop Suey. I like making pot roast. My favorite meal to prepare is one-pot pasta with asparagus and hot peppers. I love making soups, one of my favorites is a red lentil coconut soup. My favorite meal to prepare is succotash! We just recently added it to the menu and we all love it! Not only is the salad hu-uge but it is packed with fresh veggie fajitas, corn salsa, black beans, and other goodness I am probably forgetting. The salad is so juicy you don t even need to add dressing!